Members of the Northeastern racing community were saddened this weekend to learn that the man who helped comfort so many through tragedy and also guide their lives through good times with spiritual advice was now gone. Reverend Pat Evans passed away Sunday after a long fight with cancer. More important though than his legacy was the type of human being that Evans was. He was a true friend to everyone in the garage area. Evans founded the Racing with Jesus Ministries and was a fixture in the pit areas throughout the region. He grew up around racing and even drove racecars himself in his younger years. In the late 1970’s, he started RWJM. And because of the groundwork that he laid and the people that Evans put his trust in, RWJM will continue as his legacy. "Rev. 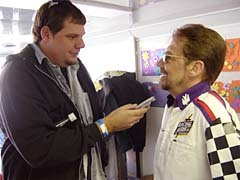 Pat was always someone who would take the time to shake your hand and talk with you,” said Speed51.com’s Matt Dillner. “It didn't matter if you were a fan, a driver or anyone. Emailing him during his illness, he always kept a great outlook on life. And even throughout his battle, he always asked how YOU were doing. He was a great guy who I shared a lot of good talks and laughs with." Evans wasn’t just a friend because of his words, he was also a friend because of his actions. He’ll be greatly missed, but those who knew Evans take comfort in knowing that he has now passed on to someplace better. “Pat Evans isn’t suffering anymore,” said Eddie Flemke. Evans was also well known to many who he never even met through his years of work as a columnist for Speedway Scene and Area Auto Racing News. Possibly nothing can describe Evans’ effect on the racing community better than what was posted by someone on the neracing.com message forum. “Our community will always be better because of him but it will never be the same without him,” said the words of the posting. Evans leaves behind his wife Betty and two children. He was 57 years old. Calling hours for Evans will be at the Dougherty Brothers Funeral Home, 595 Norwich Road, Rt. 12, Plainfield, CT 06374, 860-564-2296 on Wednesday evening from 6-9 pm. A Memorial service will be at the Quinabaug Valley Alliance Church, Rt. 169, Canterbury, CT. on Thursday at 10:00 am with a service at the Griswold Cemetery to follow. A reception will follow at the VFW Hall in Jewett City, CT. In lieu of flowers, donations can be made for the continued support of the ministry Rev. Pat started, Racing with Jesus Ministries.